The year is 1962. I’m twelve years old and walk into my sixth grade classroom. It’s a special day. I can tell because all of our desks have been rearranged into a square instead of rows, we face each other and the table that sits in the middle of the space created by the perimeter of our desks. On top of the table rests a scaled replica of Mt. Vesuvius. “On top of spaghetti all covered with cheese. I lost my poor meatball when somebody sneezed. Before the main event, the reenactment of the eruption of Mt. Vesuvius, we eat our lunch. This spaghetti looks and tastes very different then the Kraft Spaghetti Dinner with Tangy Sauce that my mother makes, where all the ingredients come conveniently packaged in a green cardboard box and always tastes the same. Today’s pasta is large, tubular and cold, the meatballs dense, the size of Wham-O-Superballs, the sauce spicy. We laugh and giggle as twelve-year-olds do as we slurp and make funny noises with the spaghetti. It’s clear we are all excited about the show ahead. We finish our lunch and sing a couple more verses of “On Top of Spaghetti” as the teacher and parent volunteers clean up, tend to the science project and prepare to light the match. 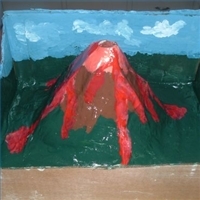 A mixture of liquid detergent, red food coloring, warm water, baking soda and finally vinegar is added to the mouth of the volcano. As we wait for the chemical reaction to begin, all eyes focused on the center of the room, I notice a discomfort building in me, bloating and pressure in my lower extremities. I begin rocking from one buttocks cheek to the other on the blonde hardwood seat of my classroom chair. Fear takes hold, I can feel a gaseous explosion preparing to vent. I attempt to hold it in as I grimace, my forehead wrinkles, eyes scrunch together and lips purse tightly shut. Suddenly in an ear-piercing reverberation, I fart loudly, my facial expression transforms into a wide-eyed look of absolute shock. My skin flushes red with embarrassment as all my classmates start laughing, bending over and holding their stomachs, while pointing fingers at me saying in a sing-songy voice, “Lenzke farted! I shake my head, no, denying it, desperately denying it, and trying to save face. I look to my friend, Christine across the room hoping she will support me, back me up and defend me from the laughter and ridicule. In that precise moment when I make eye contact with her, the laughter stops and a split second of silence is followed by a chorus of “w-o-w, o-o-h, a-h-h-h” as the volcano erupts. By this point Chris is laughing so hard at my predicament, the eruption and excitement of the moment that her bladder releases and she urinates freely, pee like a waterfall cascades from her chair. Now all of the eyes turn from the volcano and from me and watch Chris as she becomes the sideshow as fake lava bubbles down the side of Mt. Vesuvius and amber rivers flow from her chair. Mrs. F. and the volunteers are yelling Chris’s name and shouting at the class to settle down and gain control. They rush to Chris to assist as if she were injured and release the class for an impromptu recess as they clean up and tend to the disaster. As we walk outside, the attention is back on me as all the boys tease, “Did you hear Lenzke fart? Gross, that was so gross, and Chris, she peed like a racehorse, can you believe it?” The girls, including those I thought were my friends, looked at me with disgust, keeping their distance while talking into cupped hands into each other’s ears, giggling. Chris is rushed out of the playground into the car of one of the parent volunteers and speeds away home. We return to the classroom. All evidence of Chris’s accident and our lunch removed. All that remains is the spent volcano and our desks facing other. We spend the afternoon discussing the buildup of pressure that precedes an eruption, the explosion, the methane and sulfuric gases, the cascading lava, and the ensuing victims.